Jeera Rice: Zeera rice or Jeera rice or Cumin rice is a tempting rice dish of Punjabi cuisine. In its simplest form, it is steamed rice with nice flavour of pan fried cumin seeds (Jeera). This recipe may also use onion and cashew nuts stir fried in ghee to enhance the flavour and palatability. This rice dish is also widely eaten in Pakistan. We will be making Jeera rice with a little complex flavour. Soak the basmati rice in water for 30-40 minutes. Melt the ghee in the pan. Add the cumin and all the whole spices mentioned above. Let the cumin get browned and the oil fragrant from the spices. Stir and sauté for 1-2 minutes. Cover and cook the rice is cooked. The rice should get cooked but not mushy or pasty. Keep checking in between whilst the rice is cooking. 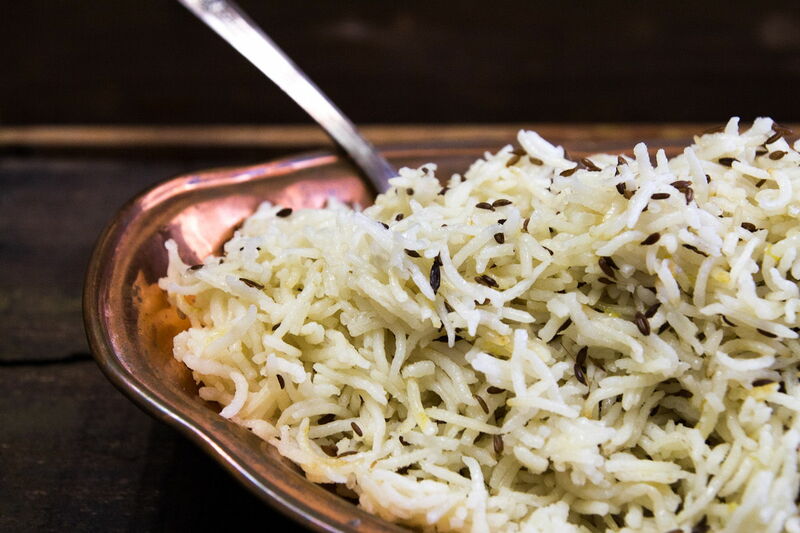 When the jeera rice is done, fluff the rice using a fork. Garnish the jeera rice with some coriander leaves and serve hot. To make Jeera rice in pressure cooker, add 2 and ¼ cups water. Add a pinch of turmeric or a pinch of saffron to colour the jeera rice. If using onions, then slice them. Brown/caramelize the onions first before adding them to the soaked rice. The jeera rice also gets a nice light brown colour due to the browning of the onions. If you have any queries regarding the Jeera Rice recipe, please leave a comment.